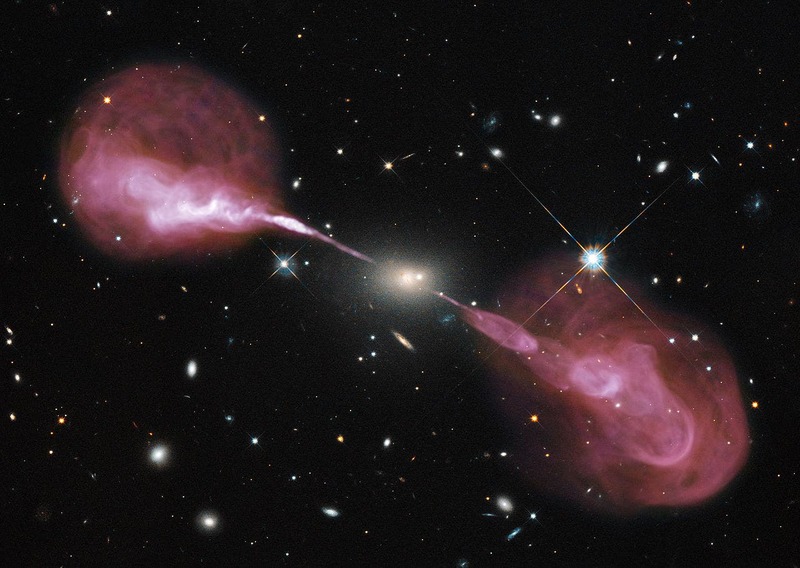 Simulation of the powerful jets generated by supermassive black holes at the centers of the largest galaxies explains why some burst forth as bright beacons visible across the universe, while others fall apart and never pierce the halo of the galaxy. New simulations of the jets produced by rotating supermassive black holes in the cores of galaxies show how, with enough power, the corkscrewing fields (white squiggles) can force their way through surrounding gas and drill out of the galaxy, channeling hot gas into the interstellar medium (top). Less powerful jets get stalled inside the galaxy, however, their magnetic fields breaking and dumping hot gas inside and heating up the galaxy. 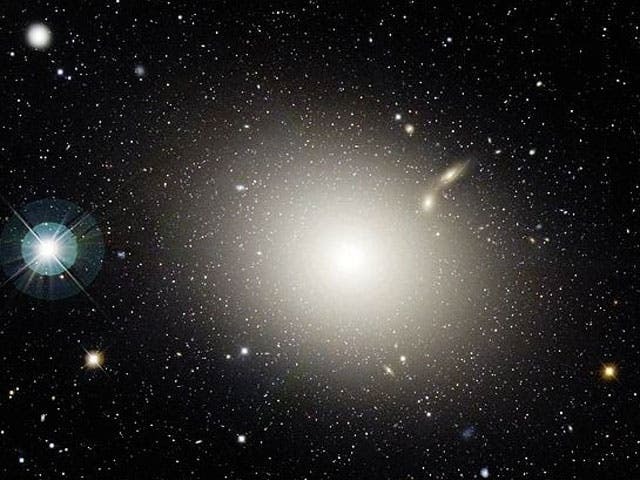 About 10 percent of all galaxies with active nuclei – all presumed to have supermassive black holes within the central bulge – are observed to have jets of gas spurting in opposite directions from the core. The hot ionized gas is propelled by the twisting magnetic fields of the rotating black hole, which can be as large as several billion suns. 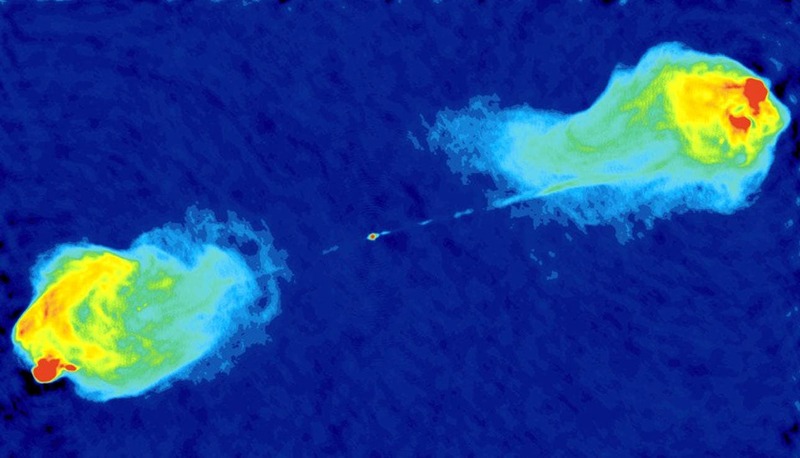 The simulation, based solely on magnetic field interactions with ionized gas particles, shows that if the jet is not powerful enough to punch a hole through the surrounding gas, the magnetic drill bends and, due to the magnetic kink instability, breaks. 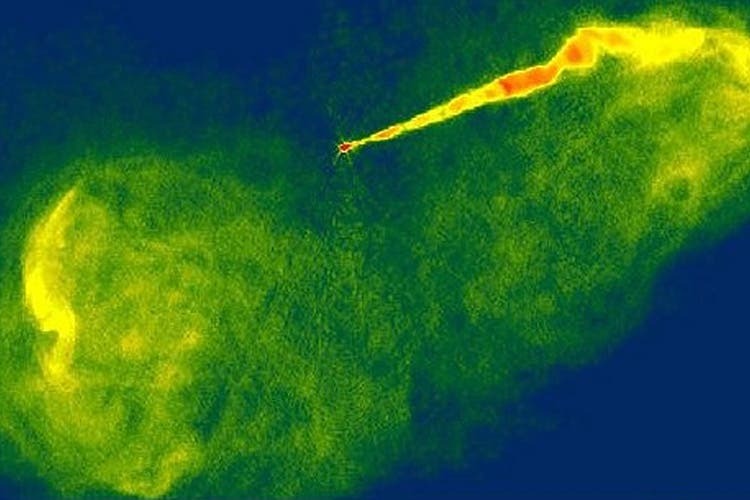 An example of this type of jet can be seen in the galaxy M87 (iamge below), one of the closest such jets to Earth at a distance of about 50 million light-years, and has a central black hole equal to about 6 billion suns. The jet in the galaxy Cygnus A, shown at the top of the page, located about 600 million light-years from Earth, is an example of powerful jets punching through into intergalactic space.